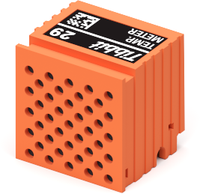 This Tibbit is based on the MCP9808 ambient temperature sensor IC with I2C interface. The sensor is implemented as the C1 device with perforated front face and a rubber wall separating the temperature sensor from the internal space of the TPS system. This is done to minimize the influence of the heat produced by the TPS motherboard and adjacent Tibbits. The MCP9808 has programmable resolution and can measure the ambient temperature in steps as small as 1/16 degree Celsius. The conversion process is rather slow at this resolution and takes ~250ms. Our sample project (see below) operates with 1/4 degree precision, which also requires a relatively short conversion time of ~65ms. 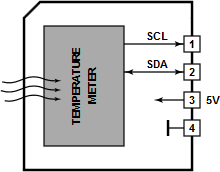 This device operates with a typical accuracy of +/-0.25 deg.C. This C1 device requires the Tibbit #00-3 to be installed in the neighboring "M" Tibbit socket. #00-3 provides two direct lines for I2C comms, as well as the ground and +5V power for the MCP9808. The use of this Tibbit is illustrated by a Tibbo BASIC test project. Yo can find it here: https://github.com/tibbotech/CA-Test-Tibbit-29.